Bring your families, friends and neighbors to honor and celebrate America’s Independence Day on the Fourth of July with the Starlight Symphony Orchestra! 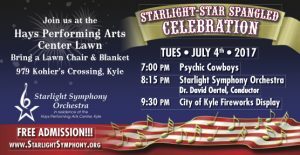 Fantastic patriotic music performed by the orchestra fills the air starting at 8:00pm, and sets the stage for a brilliant evening of fireworks and fun. Patriotic pieces such as the “Star Spangled Banner,” “Stars and Stripes Forever,” and “God Bless America”, are sure to unite. “Salute to Armed Forces” pays tribute to the brave men and women serving our country and brings out our country’s pride. Bring blankets and lawn chairs for a magical and entertaining evening of fun on the lawn of the Hays Performing Arts Center, 979 Kohler’s Crossing, Kyle, TX. 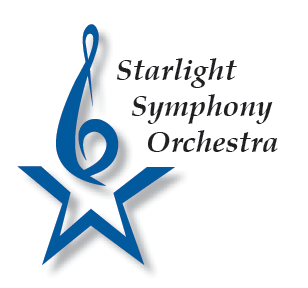 The Starlight Symphony Orchestra concerts are always free and open to the public.